Ready to wow summer camp staffs with your enthusiastic camp counselor cover letter? Check out our downloadable cover letter sample and writing tips straight from the experts for all the help you’ll need to land the interview! My name is [YOUR NAME] and I was delighted to learn of the available Camp Counselor position at [CAMP] posted on [WEBSITE]. I am currently pursuing my Bachelor of Education at the University of Oregon with a specialization in Early Childhood Development. I have four years of experience leading interactive, lively, and educational summer camps for youth ages 5-15. I hold valid First Aid, CPR, and Lifeguarding certifications as well as Wilderness First Responder Training. My education, experience, and certifications make me a qualified candidate, but my enthusiastic leadership style, passion for youth development, and dedication to providing a stimulating camp environment set me apart from the competition. Throughout my previous camp counselor positions, I have played a vital role in planning and executing outstanding youth camps. I worked closely with management and other camp counselors to coordinate programs offering a blend of developmental activities, physical exercise, and entertainment. In my position as Senior Camp Counselor, I refined my teamwork, leadership, and communication skills, allowing me to lead a team of camp counselors committed to providing an environment for children to build memories that last a lifetime. I am enthralled to have the opportunity to share my affinity for wilderness, recreational activities, and childhood development with the youth of your establishment. Thank you for considering my application to join the [CAMP] team. I look forward to setting up an interview in the near future. Not many cover letters require you to reference your arts and crafts, hiking, sports, outdoor cooking, swimming, and canoeing abilities, but these are necessities for your camp counselor cover letter. 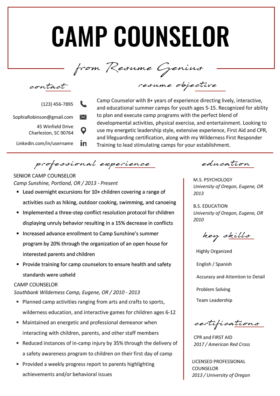 With so many unique skills to brag about, the hard part is choosing which ones to include on your camp counselor cover letter. Similar to your superb camp counselor resume, it is necessary to tailor your cover letter to the type of camp you are applying for. After all, you wouldn’t want to take up precious space on your cover letter for “Willy’s Wild Wilderness Outdoor Adventure Camp” boasting about your skills in the chemistry lab, would you? Browsing the camp’s website and checking out what kind of activities they offer is a great way to get started. Then, you can sift through your impressive experience and skills to decide what to showcase on your cover letter. Writing cover letters can be tough! If you find yourself struggling, check out our How to Write a Cover Letter Guide which includes 40+ free templates for you to use! In order to excel in your camp counselor career, you will need a toolbox filled with soft skills to be used at your disposal. You could have all of the certifications, education, and experience in the world, but they won’t mean anything without the proper soft skills to back them up. Soft skills can be defined as character traits or interpersonal aptitudes that affect your ability to work and interact with others. As a camp counselor, your soft skills are the traits that allow you to successfully interact and connect with children of all ages. These skills come naturally to you and don’t seem like anything special — but trust us, these are very important skills that not everyone possesses. It is critical that your camp counselor cover letter highlights your strongest soft skills. The hiring manager should have no doubt about your emotional intelligence and ability to relate to children when they reach the end of your cover letter. In my position as Senior Camp Counselor, I refined my teamwork, leadership, and communication skills allowing me to lead a team of camp counselors committed to fostering an exemplary environment for youth to build memories to last a lifetime. Working as a camp counselor comes easy to you, as kids have always loved you and it has never been hard for you to spend the day entertaining a wide-eyed bunch of youngsters! What’s more is that you love it — you end each day with food in your hair, grass stains on your knees, and a satisfied smile stretched across your face, ready to do it all again tomorrow! So, you sit down and begin to craft your latest camp counselor cover letter, positive that you’ve got your dream job in the bag. I mean, with your experience, education, and natural soft skills how could you not? Luckily, the above scenario is easily avoidable. Show the hiring manager that you are the whole package by referencing your successful experience working with parents, managers, and other camp counselors in your cover letter. For instance, watch how this candidate ties their experience working with managers and staff into program development. Managers are looking for a team of professional camp counselors who they can work together with to provide a safe and exciting adventure for youth. Make sure your cover letter assures them you are a team player ready to take on the challenge. That’s it! You now know everything you need to get started on your camp counselor cover letter. You can head home, break out the costume box, and start sharpening your crayons because you are on your way to landing your dream camp counselor job.